Get a fitter, healthier and muscular body with the Adjustable Kettlebell Exercise Weight Set APKB-5009 from Apex! Specifically designed to take your fitness training to the next level, this premium gym gear boasts an ergonomic construction that makes it ideal for circuit training and a variety of workouts. Perform kettlebell swings, Russian swings, goblet squats, lunge presses, Russian twists, floor presses, windmills, slingshots, and more to effectively target specific muscle groups! The adjustable kettlebell comes with a 15lb weighted handle, 4 removable spacer disks, and a 5lb bottom plate, making it perfect for both workout beginners and certified gym rats! This weighted kettlebell also features a U-shaped bar handle that’s designed to facilitate superior gripping. Its textured, powder-coated surface offers you a solid grip that won’t slip. Customizing your workout will be a breeze with this weight gear! You can easily adjust the weight of the equipment by replacing the spacer disks with your preferred weight plates. Insert any standard size 1” weight plate that weighs 2.5, 5, or 10 pounds. Use this kettlebell in your home gym for effective gym sessions that will truly enhance your body. It can be part of your circuit training or an accessory to the Olympic weight bench set for intense workouts that will get you in your best shape. This durable cast iron kettlebell set comes with two-year limited manufacture warranty to let you get the most out of your investment. With a functional and practical design, the Apex Adjustable Kettlebell Exercise Weight Set APKB-5009 is guaranteed to be a convenient addition to your exercise gear arsenal. Get this reliable, high quality equipment and enjoy the benefits of intense workout sessions without having to leave home! COMPLETE WEIGHT SET - The Apex Adjustable Weight Set includes everything you need for muscle building and weight lifting! This all-in-one set comes with a 15lb weighted handle, 4 non-weighted removable spacer disks, and a 5lb bottom plate. HEAVY-DUTY CONSTRUTION - Made from solid cast-iron and reinforced with a powder coating, this kettle bell set is a reliable gear that will last a long time! Its textured and durable surface resists wear and tear while preventing damage from heavy use. ADJUSTABLE TRAINING GEAR- Customize your workout according to your skillset with this versatile equipment. You can adjust the weight of the kettlebell between 20 to 50 pounds by replacing the removable spacer disks with standard 2.5, 5, or 10lb weights. U-BAR HANDLE FOR SUPERIOR GRIP - This kettlebell allows you to perform large movements with its traditional U-bar handle. This specially designed handle facilitates precise contact of the hands on the bar for optimal grip and superior control. IDEAL FOR VARIOUS EXERCISES - Enjoy workout out right at home with this functional gym gear! These weights are excellent for lifting, toning, and strength-training exercises or for use with circuit training and body building. 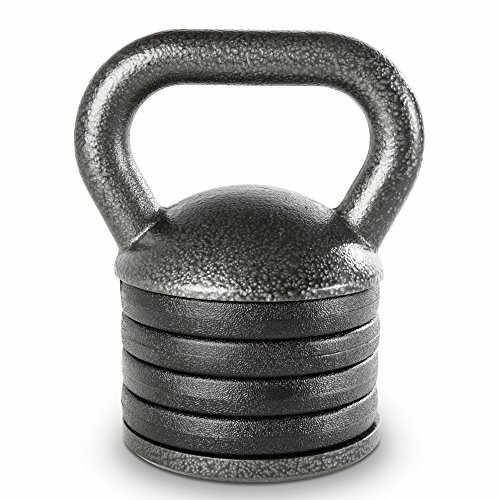 CFF 20 kg Pro Competition Russian Kettlebell (Girya) Great for Cross Training and MMA Training!